I have a long history with circuses. 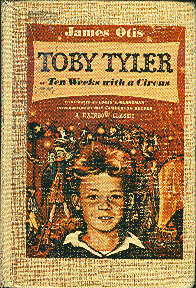 The first comes from a library book I checked out, at the age of seven, called Toby Tyler or Ten Weeks With a Circus. Now, why would I remember a book I checked out 39 years ago? Because it, like many other of my library books, was sadly overdue, and the Nichols Library saw fit to pester, scold and practically beat all its patrons (especially children) until every last nickel was paid. I had to save my money, one coin at a time, until I came up with the replacement cost for Toby. Years later he appeared. Under my bed, against the wall, long forgotten. I think I threw it out I was so mad; I know I’ve never read it since. 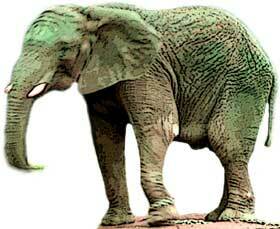 The second great encounter with an elephant was with Ziggy. He came to Chicago’s Brookfield Zoo after he had killed his trainer and was given away by the Ziegfeld’s Follies. (Hence his name.) There was an outcry on his behalf when I was in elementary school, and my mother would read us snippets of stories about him from the Chicago Tribune while we were finishing our breakfast. One of his tusks was remarkably shorter than the other, because it had been broken off in the attack, and this seemed both macabre and fascinating to my brother and I. Unfortunately, this picture does not show the discrepancy in Ziggy’s tusks. 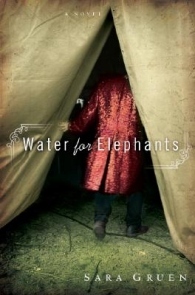 So, when all the women at school were reading Water For Elephants, by Sara Gruen, I was half intrigued and half annoyed at the thought of another circus book. Another elephant story. Fine, fine, fine. Wrong. This is a special book. It captures what it must be like to have lived, performed, and traveled with the circus in the early 1900’s. I was absolutely enthralled with the development of each character, the mood created by the author to the point where you could smell the popcorn, cotton candy, animals, and the canvas tents laid over the sawdust. There is a murder in this book, “by a mute heroine”, as well as a picture of what it is like to live with someone who is paranoid schizophrenic. It is told through the eyes of an elderly man, who must face the loneliness that old age, and diminished faculties, brings us. But, it is not sad. It is not depressing. It is not boring. It’s one of the best circus books I’ve read in a long, long time. Well, at least since I lost Toby. Previous Post Okay, It’s Not Italy. But, I Love The Northwoods All The Same. Funny how the loss of a library book can be so utterly miserable, isn't it? We were told we had overdue books that we knew we'd checked in so frequently that now I make them scan the books in front of me. I'm not satisfied till I hear the "peep" noise. All were found but one and it did turn up under the child's bed, long after we paid for it. I hate circuses, btw, but you've made this book sound more interesting than any other review I've read about it. You know, I kept hearing about this book, but just assumed I'd hate it. It sounds great! Onto the wishlist it goes!I've been owing the library money for 2 years now and I haven't been back since. I think it's only like $1.50 but I think I've blown it up in my head to about $150.00 to the point where I'm now just scared to death to step foot in there! I keep hearing about this book. Your review clinches it–it goes on my list! Thanks! Bellezza, this is one book that I've wavered back and forth, trying to decide to read it or not. No more wavering. You're review convinced me to read it – AFTER my trip.BTW, I followed your suggestion and checked out Devil in the White City. I'm not even 100 pp into it, but am thoroughly enjoying it. I might finish before I leave Sunday if I would quit checking things out online. It breaks my heart to think almost all that fair burned. Bookfool, the "peep noise": what a great term! For years, I refused to frequent the library, insisting that buying my books from Borders was cheaper than paying the fine. Now, at least, I'm better at returning them promptly. However, my son (who secretely likes Manga, the Japanese cartoon books) used my card to check out many books, and I find out they're one day late today! I think it's in his genes.Carl, I love it when New York, and other big cities, have Amnesty Days for turning in library books. I've read about them getting books that were due in 1972, but at least they're back. I had a good friend who had a stack she found from our public library 2 YEARS after she'd moved, but the library took them back without charging her a cent. I guess if one is late enough, one's forgiven.Gentle reader, I think you'll love it.Joy, I remember you saying you did, and it was one of the impetuses I felt for picking it up.Susan, isn't that funny you know about Toby Tyler like me? I didn't know, until I was copying the picture from Barnes and Noble for my blog, that it was first published in 188-something. I tried Life of Pi, but I just couldn't get into it. Many people I know love it, so I may have to try it again.Booklogged, it IS very sad that there's so little left from the World's Fair. I'm really glad that you like the book, I think it'll provide some interesting background knowledge for you. I am really excited about your trip, and I can't wait to hear about it when you're home. I keep seeing this book everywhere, and I keep thinking "Trish…just buy it." I'll have to put it on my wishlist–you give a very intriguing portrayal! Trish, I'm glad you came by. It's interesting how this book keeps popping up, and it's worth the hype in my mind. I hope you enjoy it, too! CJ, yeah, except my lists have lists. Who even knew that blogging would feed the addiction like Mickey Mouse's brooms going crazy in Fantasia? As a child, my parents took us to see the Ringling Brother's Circus whenever they were in town. We loved going.My children have never been. We live in a small town and "small" circus come by, but I can't bring myself to take them. I've always wanted their "first" experience to be like mine had been. I'll have to check out the books you mentioned. My Warrior is an animal lover. I think he would enjoy reading about the circus. :o)This is a very busy time of year. Both of our boys made the baseball All-Star Team. G.I. Joe made the Junior team, which is for 13-15 year olds. The Warrior made the 9-10 year old team. So we have been living at the fields. The Warriors first game is tonight. G.I. Joe's first game isn't until July 5th.My Knight and I celebrated our 25th anniversary. :o) I did update my other blog. You'll have to stop by for a visit. http://aknightslady.blogspot.com/Glad you visited my other blog. I need to update it. We've had LOTS happening. :o)Hope you have a Holy Spirit filled weekend! Twenty five years! Congratulations! I know how incrediably busy summer is, and especially if your boys are in sports. You must be driving them everywhere.I've not been much of a circus fan, clowns tend to disturb me, but it must have been great to see the Ringling Brothers' Circus. This book keeps referring to them, because of course they were the main competitor. Now, I'd love to see Cirque du Soliel. I thought the book was cute. We read it for our book club earlier this year. Myutopia, my very favorite part was the ending. How about yours? Great review. I enjoyed this book so much and agree that the ending is so fantastic. Thanks for the memories. Thanks for commenting on this book. I keep tripping over it everywhere I go and that usually means I need to read it! I think I'll suggest it for our library book group next year. This is one of the titles that's been nominated for our One Read selection for Lincoln. I can't remember all the other nominees, but I think The Madonnas of Leningrad is one. Like Bookfool, I don't like circuses either, so this book didn't really appeal to me until I read your review. Now I'm anxious to give it a try! Thanks, Bellezza! Les, I don't like circuses, and I especially don't like clowns. What a grotesque concept, to paint a smile on your face. Anyway, I read this book for the characters/history/murder development more than the circus aspect/ I think you'll like it. Oh my, Cirque du Soliel! We've watched all their programs that have been on the Bravo channel. They are INCREDIBLE! Disney has La Nouba and we've been meaning to go see it. I might surprise my family and get tickets for Christmas. As for clowns, I like clowns. I grew up watching Red Skelton. He was great. I don't like scary clowns though.Hope you have a blessed 4th of July!